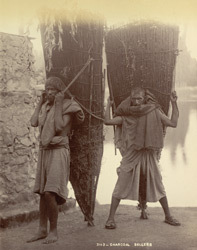 Photograph of two men, with large bundles of charcoal slung over their backs, in the modern-day state of Jammu and Kashmir, taken by an unknown photographer in the 1890s. Charcoal is a traditional fuel in Kashmir which has a long winter season. It is used to heat the water for tea-making in the Kashmiri copper or brass samovar and also in the traditional heating device, the 'kangri', which consists of an earthenware bowl, carried in a wicker-work basket; the user either carries it in their cloak or uses it as a handwarmer.